Forex price action doesn’t have to be complicated at all. Here’s a good working system based on one forex price action trading indicator, called pricefxrange. The indicator is based on the % high price and % low price for the last 100 candlesticks. The price action signals provided by this indicator are very easy to trade and appear below the main trading chart. It can be used for any form of currency trading (scalping, day trading, swing trading). Download Forex Price Action Indicator System. The 15 minute chart above is an example of this price action based system in action on the Euro/Japanese Yen (EUR/JPY) pair. 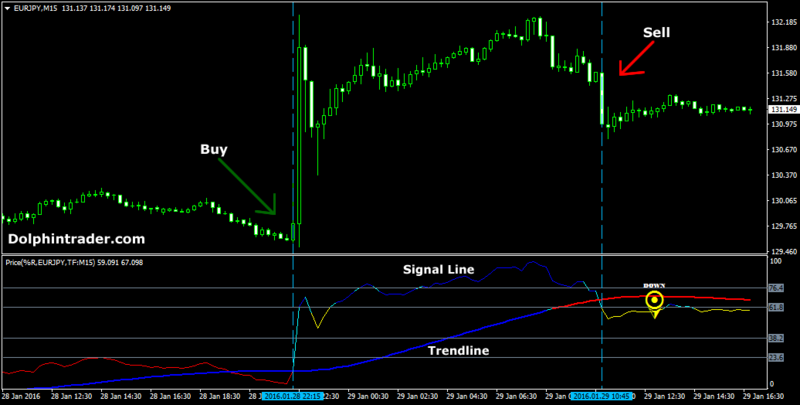 The PA indicator provided us with 2 signals, one to buy the EUR/JPY and one to sell the pair. The pair skyrocketed over 200 pips higher after the buy signal. The sell trade at 130.975 is still open. ==> This is your buy entry signal. A stop-loss order should be placed below the most recent swing low point. Take profit method: Close the trade for positive risk:reward ratio such as 25 pip stop and 50 pip limit. Alternatively, close the buy trade when the signal line crosses back below the trendline. ==> This is your sell entry signal. A stop-loss order should be placed above the most recent swing high point. Take profit method: Close the trade for positive risk:reward ratio such as 15 pip stop and 30 pip limit. Alternatively, close the sell trade when the signal line crosses back above the trendline.